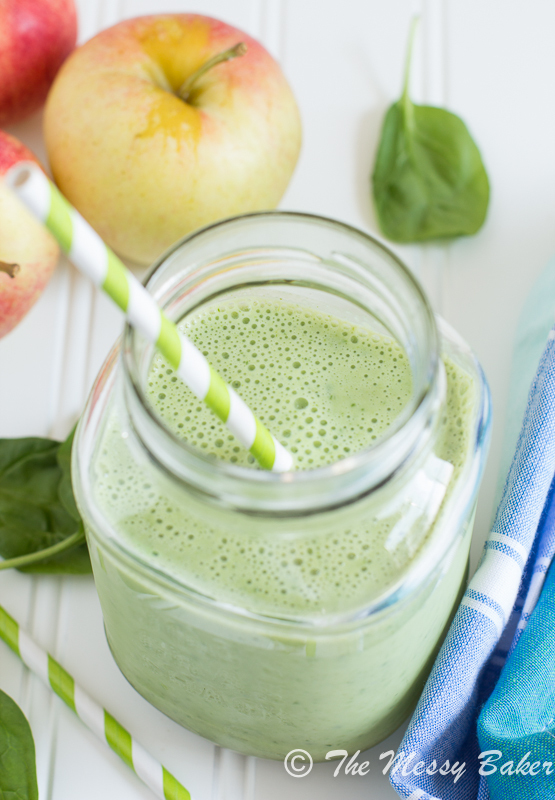 Start your day with a sweet and creamy apple banana green smoothie. I made you guys a neon green smoothie today. You can thank fresh baby spinach for the beautiful lime green hue of this smoothie. I’ve seen a ton of green smoothies on the interweb lately, so I decided to give it a go. Don’t let the green color or the word “spinach” deter you from giving this recipe a try. If it weren’t for the green hue, you wouldn’t even know that this smoothie has spinach in it. All you taste is sweet apple and creamy banana. 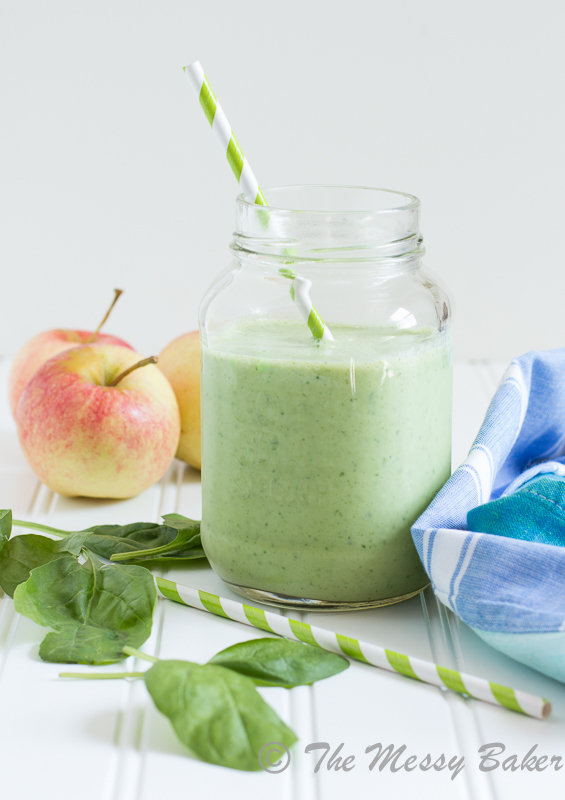 The spinach is there just to give this smoothie a boost of nutrients. If you have kids, this is a great way to sneak in veggies. I loaded the blender with sweet gala apple slices, frozen banana, tender baby spinach, vanilla almond milk, protein-packed Greek yogurt and almonds. 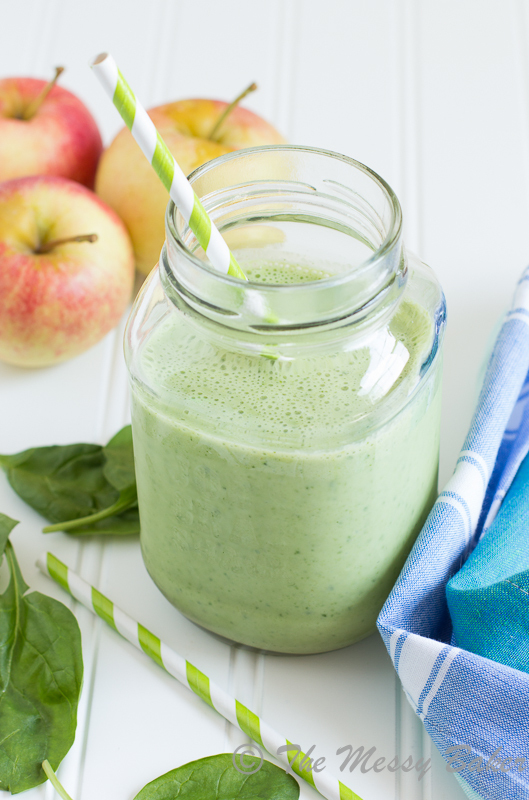 The apple and banana mask the flavor of the spinach, leaving you with a sweet, creamy smoothie. Let’s learn a little bit about spinach, shall we? Spinach is rich in antioxidants, essential vitamins, and minerals. It’s packed with vitamin A, C, E, and K. It’s also rich in iron and calcium and contains a significant amount of lutein. All of these essential vitamins and minerals promote immune and bone health, cell growth, healthy skin, and a boost of energy. 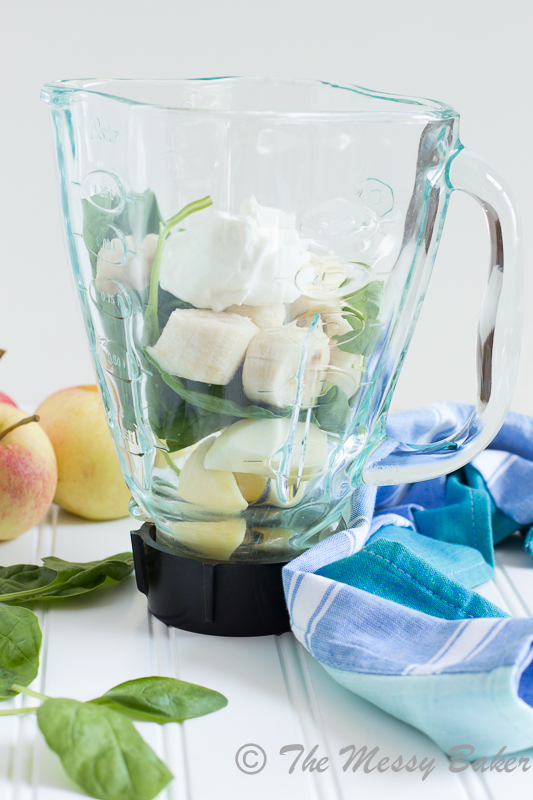 Combine spinach with fresh fruit, and you have yourself a super smoothie. Rich, creamy, and slightly sweet, this smoothie is sure to please. Place all of the ingredients in your blender. Blend until smooth. Such a fan of a good smoothie for breakfast in the morning! My boyfriend is a coeliac so he has a smoothie instead of cereal or toast every morning, will have to get him to try this one out! I’ve been meaning to add apple to my smoothies for about 1,000 years and still haven’t done it! Your smoothie looks delicious! Perfectly sweet and creamy and filling, just the way I like ’em! I will most definitely get on board with this, seeing as I have all the ingredients on hand! Yup. Anyway, I could use one of these smoothies right now. I need to get on the smoothie bandwagon. They are so easy and this looks so pretty! I love the color. I just told my Hubby we should drink more smoothies. This sounds perfect! I just made this with kale instead of spinach and without yogurt. . very yummy! Hi, Jennifer! I’m so glad you enjoyed the smoothie. Kale is a great veggie for smoothies. Thanks for visiting! PRETTTYYYYY! It looks so fresh! It looks and sounds refreshing and delicious. i actually love spinach in smoothies and juices: it doesn’t have as strong a taste as kale, and it makes everything feel super good for you. i’ve never thought to pair apple and banana together either in any of my smoothie/juice experiments, so this will be fun to try. Gorgeous smoothie, girl! LOVE the flavor combo here and I must make some soon. LOVE! Thanks for sharing and have a fabulous autumn weekend! xo P.S. Oh! Thanks for joining my sweets board at Pinterest! I love the color of this smoothie! Definitely have convinced me to try one of these green smoothies, it sounds wonderful! Thanks, Jenn and Seth! Let me know how you like it. Looks splendid! I love me some spinach in my smoothie. Thanks, Casey! It sure makes for a purdy smoothie. I love using almond milk in a smoothie, but I’ve never added almonds. Love that idea and love this smoothie. Great time of year to throw in an apple! Thanks, MJ! I love that the almonds thicken the smoothie and add a boost of protein. Nice, simple recipe. Looks delicious – and your photography is superb. Congrats! I’ve noticed that almond milk does wonders for my tummy. Thanks for the recipe. I adore almond milk, Maggie. Thanks for stopping by. I love a good smoothie. It’s the easiest way I know how to sneak in veggies to my son. I tried this today. I had all the ingredients and used my brand new Ninja. It came out amazing! I wanted to make two servings for my husband and I, so I halved everything into the two single serving cups, but added more almond milk and a scoop of vanilla whey protein powder to each. The calories come to about 400 each Ninja glass, and this is so filling. Thanks so much for sharing! Great smoothie ! Made it just as the recipe stated! Pretty color and refreshing ! Thanks ! I even forgot to put in the honey the first time I made it and it was still really good. So imagine my surprise when I actually included ALL of the ingredients. Hi Matt! Thank you so much for stopping by. I’m so happy to hear you enjoyed the smoothie. It’s a great recipe, and, even better, it’s healthy! Thanks for taking the time to leave a comment. Happy sipping! Just made this smoothie and it is DELICIOUS! The first green smoothie I ever made and it’s so sweet and refreshing (I don’t even think it needs honey because the fruit is naturally so sweet!) 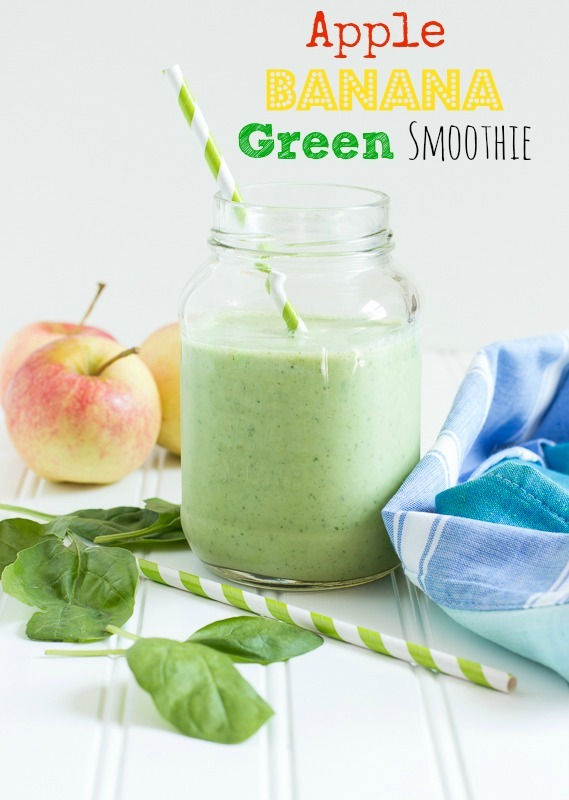 This is a perfect transition between creamy fruit smoothies and green ones. Will definitely make again! This was yummy!!!! My husband who doesn’t usually like spinachy things also loved it. Thank you :) :) !! Any idea how many carbs are in this smoothie? I was looking for a new green smoothie with protein to change things up and this was just the ticket! :D So delish, my toddler and husband loved it as well! I used coconut milk instead of almond milk, left out the honey, and added some ice to give it a nice chill. Thanks! I can’t agree with this. Trump’s actions on this issue are simply idiotic. I enjoyed this recipe. Thanks for sharing. As someone who is counting calories as I exercise more and eat better, I crunched the numbers to figure out some details for the whole recipe. These are estimates of course.